Activity is increasing for Killearn Estates house sales, with unit sales up 14% through May of this year versus January through May of 2011. If you are thinking of buying a Killearn Estates house, then your timing is pretty much perfect. As you can see in the real estate graph above, the average Killearn Estates house has dropped 31% in value since the peak of the market. The average price per square foot of a Killearn Estate house in 2006 was $134 per square foot, while homes this year have been selling for an average of $92 per square foot. 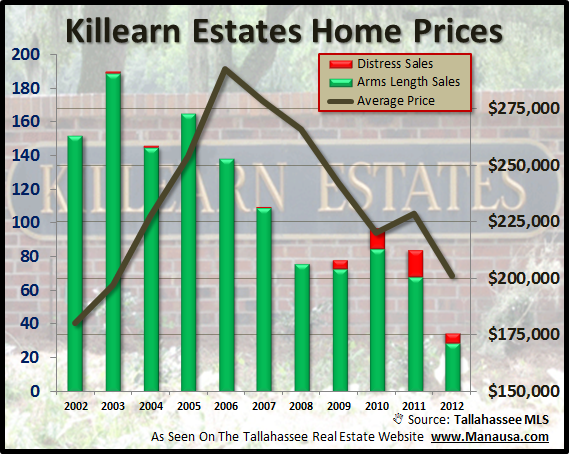 Currently, there are 65 homes for sale in Killearn Estates in the Tallahassee MLS, as well as many more that have tried to sell in the recent past that most likely will be re-entering the housing market next year. With the average price of a Killearn Estates house going for just over $200,000 (down 12% from this point last year), we can expect to see more and more buyers coming in to scoop up these values. Interest rates have made another turn down. The "cost of money" has never been lower, and it is likely to be this way for only a small window of time. Join other buyers who are getting rates below 4% to steal a Killearn Estates house with a monthly payment similar to renting an apartment. If you want in to Killearn Estates, do yourself a big favor and contact me today! Last year buyers were attracted to the larger Killearn Estates houses, and this year seems to be similar. 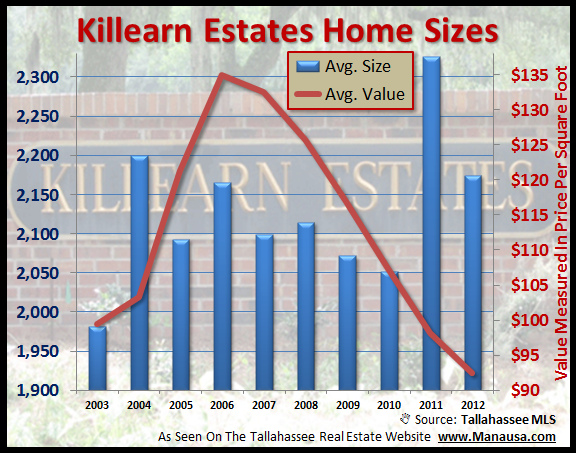 The average home size last year was over 2,300 square feet, and this year the average Killearn Estates house size sold has been 2,175. The real estate graph below shows just how much larger than "normal" these two years have been.